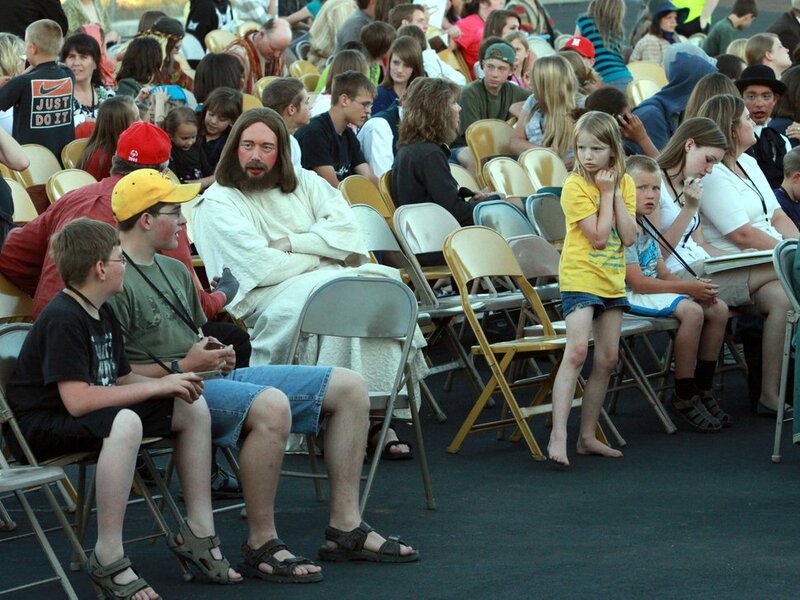 (Rick Egan | The Salt Lake Tribune file photo) A scene from the "Mormon Miracle Pageant," which depicts the Book of Mormon's account of Jesus Christ's appearance in America, is seen in the 2011 file photo. 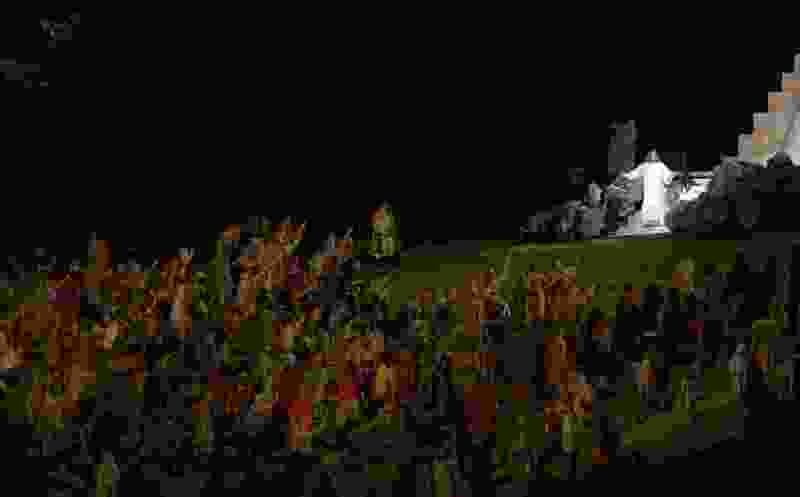 The spotlighted sight of a white-robed Jesus preaching outside Manti’s landmark Latter-day Saint temple will be seen for the last time during next year’s performances of the Mormon Miracle Pageant. In October, The Church of Jesus Christ of Latter-day Saints announced it was ending its support of live-action pageants. But some advocates of the half-century-old Manti pageant held out hope that local Latter-day Saints would continue to mount the show that had become almost synonymous with the tiny central Utah city of 3,500 residents. Not to be, pageant President Milton Olsen said Monday. Those final shows are set for June 13-15 and 18-22. Since its 1967 premiere, the pageant has attracted tens of thousands to Sanpete County for the free summertime spectacle, which depicts stories from the faith’s signature scripture, the Book of Mormon, including a dramatic visit of Jesus Christ to ancient America. Rick Egan | The Salt Lake Tribune Members of the cast are seen before a dress rehearsal for the "Mormon Miracle Pageant" in this 2011 file photo. The visitors — about 75,000 for the 2018 performances — filled motels, hotels and restaurants. Many enjoyed Manti’s famed barbecue turkey sandwiches, offered first at two Latter-day Saint meetinghouses and later at an armory. Hundreds of area residents sewed costumes and donned them (last year alone there were 900 cast members), or worked on makeup, lighting, sound, security and traffic control. Oh, and set up chairs, rows and rows of chairs. It was, indeed, a mammoth community undertaking. Dean Halling, a past president, agreed. Its ending, he acknowledged, will have an economic impact on Manti. “But we see a need for change,” Halling said. “I think it will be a good thing." Lily Jane Miller, an 85-year-old Manti resident who was present at the first show decades ago, isn’t so sure. Through the years, Miller was in the live chorus, providing background music, once played Lucy Mack Smith (mother of church founder Joseph Smith) and helped sew costumes. John Keeler, who directed the pageant from 2012 to 2016, has mixed feelings about the end of this era. For the past 50-plus years, Keeler said, the pageant has been an essential part of community life in Manti, especially for the city’s young people who participated. It has required the work of more than 50 committees and 70,000-plus volunteer hours, he said, uniting the town on a joint project. Motels will probably see the biggest decline in their bottom lines for those two weeks, plus the city, which has provided dinners for attendees, will lose lots of money for local projects.